The promenade at the beach will take you to Aqua Natura water park where the whole family can enjoy a wonderful day out. 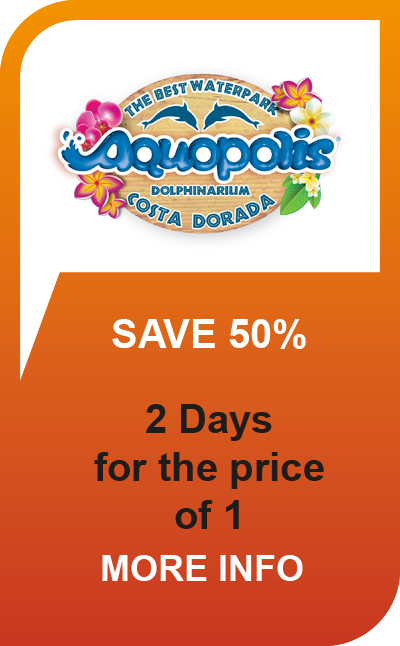 If you want excitement, thrills, fun and relaxation all in one place then you will find it in Aqua Natura. La Cresta is the only water attraction in the world where you can experience the feeling of zero gravity! There are four pools to enjoy including the fabulous wave pool covering 5000 square metres and containing 6000 cubic metres of water. The Adventure Island, an area specially designed for children up to 12 years old and many more attractions including sundeck and picnic areas make this a great family day out. The Eye of the Cyclades, Black Hole, Adventure River, Kamikaze and Zig Zag slide will get the adrenalin flowing then you can relax by the beach bar and enjoy a refreshing drink!